When the opportunity arises, grab it! About thirty-three years ago I was cruising around Hawai’i Island checking out the many public works of art at various state buildings; that is what I did for fun in those days. As I drove around Kona, I could hear a buzz in the community about ‘Iolani Luahine performing at a hotel in Kona. I even drove through the porte-cochere thinking I might just attend the event. Not sure why I changed my mind; I told myself that I would catch it another time. Sadly, that was her final hula concert and I regret not attending the event. Today, if any opportunity arises that I want to experience, I am there. For nearly 500 people, the opportunity to see Kawaikapuokalani Hewett share his hula, songs and stories was not missed on January 24, 2011. When many artists wish to record your songs and when many hula halau want to dance to your songs, there must be some special intangible quality in the melody and the lyrics that inspire others to sing and dance to your songs. “Hawai’i Ku’u Home,” the song he taught to the ukulele circle, expresses his love for Hawai’i as the most beautiful and unique place. “My songs are simple with only two chords so everyone can sing it and I won’t forget it while singing on stage.” His songs, while simple, have a quality of authenticity or realness about them. Those present at the Kaua’i Beach Resort were privileged to catch a glimpse into the why and how of how a few of his many songs came to be. The evening was filled with stories about Kawaikapu’s life journey. I always thought of him as a serious person but his delivery was filled with humorous anecdotes and spot-on mime action of the major hula influences in his life. And the hula … watching this stately figure dressed in his characteristic tunic shirt, covered with leis, move gracefully in a trance-like hula reaching high up to the sky and low to the grounds with just a suggestion of a smile that transforms his expression into one of sheer bliss … was a treat for the hushed crowd. It’s hard to take your eyes off his hands, each finger moving independently in its own expressive choreography but being part of hands that visually capture the rich lyrics of the song and accentuate the glottal pauses in the leo, characteristic of some of Kawaikapu’s songs. He opened his presentation with a chant about family, love and responsibility taught to him by Kahuna Emma Defries delivered in a voice that seem to come from somewhere out of body; it set the tone for the evening. I was struck by the similarity of his intonations with those in Buddhist sutras. The story behind the chant was that Pele and her family was traveling by canoe from from Bora Bora and Tahiti moving East through the Pacific to find a new home. They stopped briefly at Nehoa and then continued their journey to the next island, finally realizing they had forgotten one of the younger brothers on Nehoa. They debated about turning around and observed, “Nehoa is big enough for one person,” but Pele decided they started the journey as a family and will finish as a family. They turned the canoe around and headed back to Nehoa. The stranded brother, upon seeing Pele standing at the bow of the canoe with open arms, was moved to tears and uttered this chant. First of all, “shear fear” of being poked with walking canes and being verbally reprimanded by the ruling hula matriarchs of the day back in the 1970’s when Kawaikapu was paying his dues in learning to become a hula dancer. Mary Kawena Pukui, Lokalia Montgomery, Alice Namakelua, Genoa Keawe and other significant Aunties attended all the performances and criticized any mistake with a poke of their canes even while a dancer was on stage. This was cause for anxiety and determined never to be treated as such, Kawaikapu went ahead and wrote his own songs and performed hula to his own songs, leaving no opportunity for the aunties to criticize his dance or songs. Needless to say he acknowledges the early strict training was invaluable to help him in his own journey. He was taken in early by Kahuna Emma Defries and mentored by many of the top hula teachers including Edith Kanaka’ole, ‘Iolani Luahine. Marion Haleokeawe Espinal and Lani Kalama. Kawaikapu’s father was the son of a French-German from Switzerland who married a Hawaiian girl in Hanalei so he has family ties to Wailua, Koloa and Hanalei. Raised by his parents and maternal grandparents, Frank Kana’e and Iwa Rowan Kana’e, hula was important from a young age. Working in the taro fields from before the sun came up, his Dad was his inspiration and supportive of his hula but his Mom resisted with, “This kid look like a d—- mahu; he will dance over my dead body!” and his Dad would reply, “Don’t tempt me!” Told from a young age that he was to do the hula, he went along not realizing how much he would come to love the hula. This love is so evident whenever he slips into the healing dance of hula. His mom feels tormented everytime he dances the hula, but she has learned to live with it. He describes theirs as a love-hate relationship but today 80-year-old Mom lives with Kawaikapu and he takes care of her needs. His experiences were not limited to hula; he spent many years as a teacher in the schools – elementary, Molokai high, Leeward community college — and his regular Thursday gig was the captive audience in prison. Like many teachers, he constantly meets former students and when he asks, “How do I know you?” The reply comes, “From prison.” “Oh, nice…I see you are out now.” He also recounts meeting former students with many kids who tell him, “You haven’t changed.” And his response to them is, “You have!” I can truly relate to this after my own nearly 38 years in the public schools; some days if I am buzzing around the island I will meet up to five of my former students in one day. He went from island to island on a weekly rotation for 13 years and somewhere in all that time he spent many years on Kaua’i coordinating the luau show at the Coconut Beach Sheraton in Waipouli. He attributes all these experiences invaluable to the work he does today traveling from Siberia to New Zealand, from Tahiti to Australia to Japan where he lives for many months each year; he works with his halau all over the world and they come to his School of Hula and Ho’ola in Ola’a on the island of Hawai’i. “I have fifty more good years to teach until I hit 108”, so he travels extensively; although he loves the travel, he misses his five children and 11 grandchildren. “In my heart I know who I am…I am Tutu Man” he says as he shares that he has to fly out tonight so he can feed his granddaughter breakfast before she goes to school and before he flies off to Japan. Huge sigh from audience. A blessed life indeed. Most recently dancers from his halau in Russia spent time in Ola’a, Mountain View, during the eruptions of Hale’mau’mau and Kalapana. The eruption of the volcanoes is a major source of inspiration for him as he shares “Kupainaha Pele I Ke Ku Ko” about the fire goddess Pele. His halau from the north shore of Kaua’i, Na Lei Kupua o Kaua’I performed the hula. “What should I call you?” he asked his dancers and the answer came “White Rats”. Kawaikapu explained that when he was born, his very dark-skinned nearly pure Hawaiian Dad affectionately called him “White Rat”, a term of endearment, because he came out as a fair-skinned Hawaiian. He preferred to call his halau “Haole Hula Girls” which indeed they are. Studying with Kawaikapu for 18 years under the guidance of Susan Floyd and ho’opa’a Fern Merle Jones, the halau appreciated the rare opportunity to dance with him. For the chant “A Ka Luna Au o Pauahi” he describes the eruptions of Pu’u ‘O’o covered with mist and the smoke rising out from the eruption, the beautiful white bird flying around in the red sky, thunder and lightning echoing the eruptions … in moments like this creativity is inspired and the poet within begins to hum a tune and gradually the lyrics emerge from a deeper consciousness. Once he gets the lyrics of the first verse, the rest of the song falls into place. It was a simple demonstration but he really let us see his creative process in action. Kaua’i for him was a great inspiration. 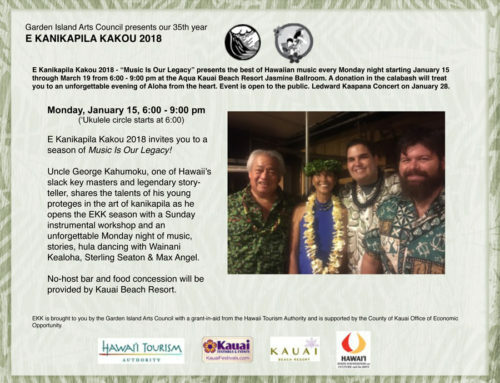 His “Mo’o’olelo” CD is filled with songs about Kaua’i, especially the area from Makana to Ke’e, home of the legends of Pele, Lohi’au, Hi’iaka. He related the arrival of Pele’s spirit on the haunting strains of nose flute that turn to Pahu drums as she neared Kaua’i. The legend goes that she fell in love with Lohi’au at the hula heiau in Ha’ena, and they spent five days together. As she leaves for her home on the island of Hawai’i, she tells Lohi’au she will send her sister Hi’iakapoliopele to fetch him. Lohi’au’s grief was unbearable and he hung himself. When Hi’iaka came to fetch him, she had to use all her powers of healing to fight against the two Mo’o wahine protecting Lohi’au’s grave and to bring him back to life. This story is very important in the hula and the healing tradition as are Pele and Hi’iaka. “Aloha E Ka Laua’e O Makana” is the song and hula that he shared about the area of Makana. Is hula a healing tradition? There are many stories of Hi’iaka as a healer. Hula chants are the healing chants is what Kawaikapu wanted to put across with the story of Malai Ha’akoa, a cripple whose wife had to carry him down to Wailua to fish. When Hi’iaka was looking for Lohi’au and arrived at Malai’s home in Wailua, Malai’s wife did not come out, so Hi’iaka chanted the password chant at his closed door. No answer. The crippled Malai on the beach in Wailua had a vision of Hi’iaka’s prayers so he stood up and ran all the way up the hill to his home to greet her. From this story comes the password chant which is a part of today’s hula protocols. A student who is late to class must stand outside and chant the password chant and only if the kumu chants a response chant will the student be allowed access. Kawaikapu shared both the password chant and the response chant granting access. Before the intermission, the moment everyone was waiting for was “Hi’ilawe,” one of the first songs he learned from Auntie Edith Kanaka’ole. OMG….talk about a vision! It was a hula that one can call back over and over in one’s mind’s eye because it was unforgettable in its beauty. When he dances he thinks of nothing but his teacher Auntie Edith. Kawaikapu has many fond memories of Kaua’i. Twenty years ago, the Kaua’i Beach Resort in an earlier incarnation was one of Kawaikapu’s regular haunts as he performed with the Makaha Sons in this very ballroom. Another hotel venue well known to him is the Aloha Beach Resort near the Wailua River. He performed with Palani Vaughan and remembers well the little grass hut on stage where Samoan fire-knife dancers performed in Polynesian revues. Being as tall as he is, when he danced his hands touched the ceiling of the grass hut and it wasn’t until trickles of laughter emerged from the audience that he realized his hands were all black from the soot on the ceiling above him. Having taken Codeine for his cold, he was quite a bit out of sorts and because his heart was beating so fast, he danced so fast that he finished the dance while the musicians were still on the second verse. Palani asked him what was up with him; Kawaikapu told him to play the song “correctly” and he did. The two glasses of wine might also have been a factor. Whenever on Kaua’i, Kawaikapu has the urge to go to Ha’ena to offer a prayer to Ke Akua and aumakua; this is a tradition practiced by each kumu. He described how when offering a prayer, rainbow after rainbow after rainbow appeared over the turtles swimming in the ocean. Whether it was real or not, it did not matter; it only mattered that he followed proper protocol … and he had not taken Codeine. “Kaua’i Hemolele Ika Malie” is a song the halau dancers shared. George Naope was a major influence in his life. In the 1980’s when Kawaikapu wrote the song “Aerobacize Hula” which people either liked or did not like, Naope came to his support and as the consultant of a hula documentary, he invited Kawaikapu to be included in the hula documentary as a person with good foundation and training and that “Aerobacize Hula” is where it was. Uncle George asked him to judge at a hula competition on the island of Hachijojima. Although it was mid day the sky was pitch black at Haneda Airport because a typhoon was approaching. They flew anyway in all the turbulence to get to their destination. As they approached the postage stamp-sized airport that was smaller than Lanai’s or Molokai’s, a huge circle with a rainbow appeared in the pitch black sky and the pilot was able to fly the plane right through the circle and land on the little island. Once on ground they were not allowed to disembark until the village greeting committee arrived at the airport . . . which turned out to be all five children from the high school singing “Hawai’i Ponoi”. He recalls how touching it was to receive from them beautiful hibiscus blossoms leis which were so huge that one lei covered the whole face. From this experience he was moved to write a song for Uncle George Lei Lanakila Naope — his teacher, his mentor, his good friend. On his CD the song “Pu’u Alo’alo” is sung by his daughter Ula. The Haole Hula Girls danced the hula. Recalling Uncle George’s last day, Kawaikapu and Keale Ching sat at his bedside and sang while George slept. As they got up to leave, George woke up with a big smile and asked them to dance the “Hukilau” hula. They did. He started laughing so Kawaikapu knew he was not going to die that day. He left for Japan the next day and then received the call that Uncle George had passed on. Twenty years ago while in Ola’a, he wrote “E Ku’uipo Ola’a Beauty”, the name of a tiny purple flower that take 1,000 blossoms to make one lei. The song is based on the legend of High Chiefess Laie-I-ka-wai who tried but never did find her true love. She finally married the Sun God and lived in the heavens with his parents. While the Sun was visiting the Earth, Laie went to the temple and looked into a bowl of water to see why the Sun was away so long and saw him with her twin sister Laie-lohelohe. Laie cried and cried with sadness so his parents placed her into the heavens as the twilight. The Sun God was banished from the Sun by his parents and became a wandering spirit on Earth. Little did Kawaikapu know then that twenty years later, his home would be in this very place. He brought his evening of sharing his songs, stories and hula to an end with this exquisite hula. When Kawaikapu dances, he owns the stage. He creates an aura as he moves with a grace that comes from deep within … it is more than a dance, it’s a transformation. “Aloha brings life. So I coined this phrase, ‘ ‘O ke alohaka mea ho’ola ai’, love or compassion brings forth life or healing.” This sums up the life message from Kawaikapuokalani Hewett — composer, hula master, teacher, Tutu Man. An evening of hula with Leina`ala Pavao Jardin, Halau Ke Lei Mokihana ‘o Leina’ala. Former Miss Aloha Hula Leina`ala Pavao Jardin brings award-winning halau members to perform – keiki, opio, ladies and kupuna. She’s devoted to perpetuating the Hawaiian arts and culture as well as guiding her dancers to be better persons. It’s not all about winning, although her halau does just fine in that department. Her halau has been outstanding at the annual Keiki Hula Competition on O’ahu. If you have a disability and need assistance call Carol Yotsuda at (808) 245-2733 by January 31 for February 7 event.